With YouTube already banned, Pakistan demands Google filter blasphemous and pornographic content—or else. As of today in Pakistan, despite the change in government with our recent elections, the six-month ban on YouTube continues, and there are few signs that anything is really going to change. No sooner had she said this than howls of protest rose up from Pakistanis on Twitter and Facebook. Most berated Rahman for not realizing that Google was not just a search engine, but the largest search engine in the world. Not to mention the fact that Google is the provider of numerous Web applications, including email, data storage, and blogging platforms, as well as the base for Android smartphones, which are increasingly popular in Pakistan. It would be a huge blow to society even if the government only impeded access to Gmail. 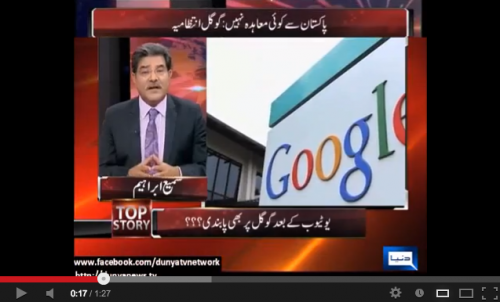 How could the Minister of IT and Telecommunications not realize the enormously detrimental effect that blocking all of Google would have on Pakistan’s economy? However, social media users are unaware of how the process of blocking and unblocking sites like YouTube works in the corridors of Pakistan’s bureaucracy. To find out about this, I spoke to Afia Salam, a media consultant and journalist who is active on social media, about the ban. With this level of confusion about the mechanism through which YouTube can be unblocked in Pakistan, it’s no wonder people are so upset. I’ve heard rumblings about how it suits the government to have YouTube blocked because Pakistanis no longer have access to alternative news reports and video clips from whistle-blowers. But most Pakistanis are upset about the YouTube ban, not just because it violates freedom of expression, but because we no longer have access to our entertainment—music videos, Game of Thrones clips, footage of cats sleeping in boxes—or other sources of information—lectures from international universities, Ted Talks, and instructional videos on a variety of topics, including Islam. As for me, if the Minister of State goes ahead and blocks Google, rendering my Android phone useless, I’ll be sending her the bill. 3 Comments on "Singing the YouTube Blues"
“Blocking” – is really the mindset of bureaucracy/establishment ….sec 144 ban. don’t know how china, Iran etc block content on you tube and web, but then again their people don’t react like Pakis. Pakistan should come up with something similar very soon and allow people access to information and content which is their right. Let the confusion, irresponsibility and lack of ‘knowledge and understanding’ prevail on the part of the government and We will all get habitual to finding shortcuts and ‘other’ ways to get to what we want. By the way, when was the last time our government thought about the common man’s interest? The move was political in nature. A lot of IT enthusiast will really be upset of such move. The government of Pakistan should take aside their personal motives and think of the future lies behind updated information which can be found in youtube. You can learn more from videos than any other form of communication.